Firstly we must apologise to Across The Pond Wrestling and readers of these articles for the lateness of this week's edition. Solely due to real life getting in the way. However, let's move on to wrestling life and get Ready For The Weekend! 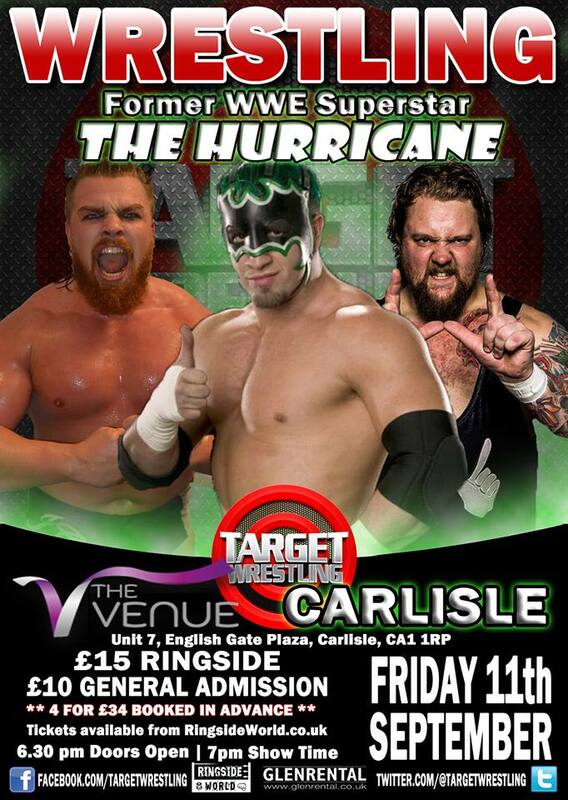 Kicking off the weekend on Friday night, Target Wrestling are back at The Venue in Carlisle, Cumbria. The event will feature international star, 'The Hurricane' Shane Helms teaming with, the always impressive, Mark Coffey to face the duo of T-Bone & Bubblegum. Helms has won numerous championships during his career and Mark Coffey in a bona-fide world class athlete in his own right, whilst their opponents are no strangers to each other and have been partners on numerous occasions. This should be a great action filled match for all to see. The Target Wrestling Heavyweight Championship is also on the line on September 11th when Joe Coffey defends against a surprise opponent. Originally scheduled to face Kris Travis who unfortunately had to withdraw due to a stomach injury, Coffey now faces the unknown but the 'Iron Man' has never been scared of a fight and shall welcome the challenge. For months, Alexander Henry has caused chaos in Target Wrestling with his cohorts. Now aligned with Jason Prime and Rampage Brown, they are set to face a group who live to cause chaos, The New Age Kliq's Stevie Xavier, BT Gunn & Wolfgang. These groups have a real dislike for each other and Carlisle may not be able to withstand the inevitable war that is coming this Friday. 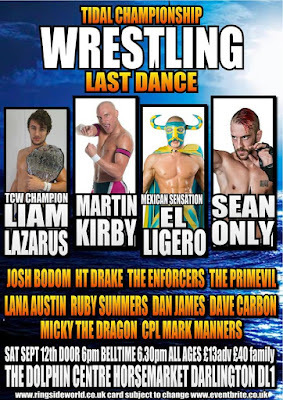 Moving on to Saturday and Tidal Championship Wrestling host their final event at The Dolphin Centre in Darlington, County Durham, Last Dance. One match of interest at the event is Martin Kirby vs. HT Drake. Now Kirby is considered one of the best wrestlers in the UK and rightfully so, HT Drake on the other hand is a great up and coming talent from the North East of England. This will be great test for the young HT Drake against such an experienced opponent. At Spring Storm Dan James and Dan Evans were tag team partners. Move on a few months and these two are now no longer partners or even friends. They have their differences and the only way to resolve them is to fight it out on September 12th. 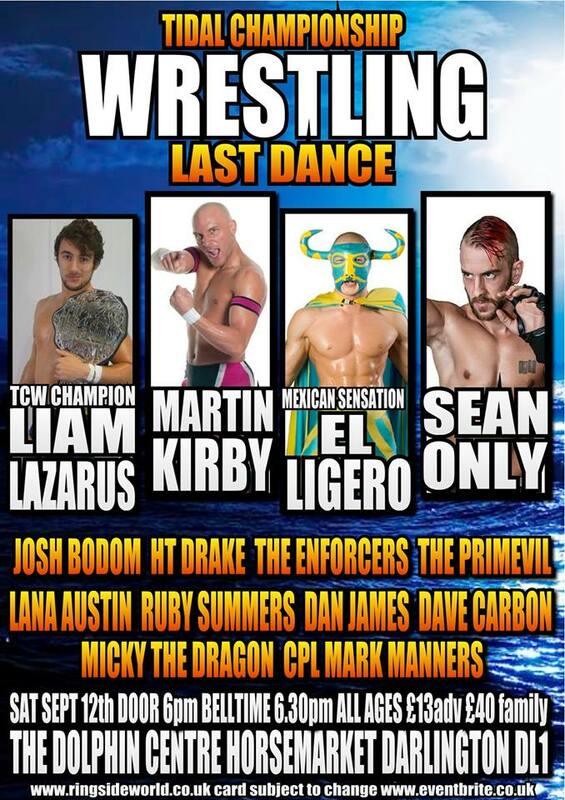 In the main event, Liam Lazarus puts the TCW Championship on the line against the first ever champion, 'The Mexican Sensation' El Ligero. These men have faced each other in TCW twice before with both holding a victory over the other. Now it's time for the rubber match with the gold up for grabs. On Sunday, PROGRESS Wrestling are back with another edition of their ENDVR franchise which is now holding it's 12th show, at the Garage in Islington, London. A place in the Natural Progression Series will be up for grabs when the very unique Jack Sexsmith faces Australia's Josh Shooter. Shooter is a world-travelled athlete and Sexsmith has become a a real fan favourite in the ENDVR ranks. This is a big test for Sexsmith but one he'll want to overcome to gain entry to the Electric Ballroom in the near future. At PTNTL:2, Jinny demanded that she be given a tougher challenge in her next match. PROGRESS being a company that listens went and found Jinny a bigger challenge in the shape of Toni Storm. Jinny and Storm have crossed paths before when Jinny interfered in a match between Toni and Elizabeth, Jinny's PA. Now the woman the fans have christened the "Primark Princess" gets the chance to face a tougher challenge and Toni Storm gets a chance to gain some revenge. In possibly the strangest combination of characters in wrestling, Pastor William Eaver & Chuck Mambo are back in tag team action against one of the most decorated tag teams in British Wrestling today, The London Riots. Sweet Jesus have scored some big wins during their tag team career. The London Riots would be a huge team to defeat but it won't come easy.